This Feiss Kelham Hall British bronze finish 4 light pendant with Scavo glass up-lighter shade is classic and features Art Deco style. 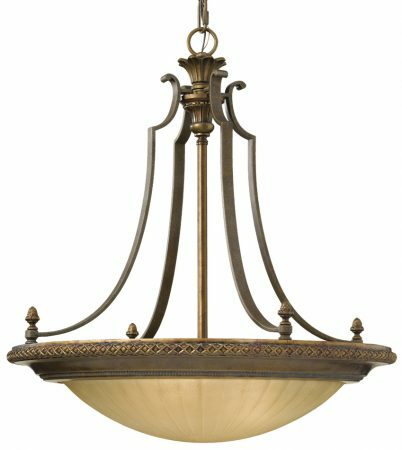 With detailed circular ceiling mount, chain suspension and central rod featuring a feather top sconce and detailed casting. Four scrolled ironwork bands drop down and are attached to the shade frame by acorn finials. The ceiling and shade mounts feature a Firenze gold highlighted herringbone pattern around the rim and curved concave sections, with geometric inner pattern. The glass up-lighter shade is the finest India Scavo glass that gives a wonderful light from the four enclosed lamp bulbs. Scavo glass provides a gentle weathered look to the glass, softens the light and adds to the overall appearance of the fitting. It is first cast, then a special corrosive substance is applied to the inner surface, which dissolves the top layer and gives an etched finish with a hint of iron oxide. When this type of glass is used for lighting fixtures, it gives the light a soft organic look that is perfect for creating a relaxed space. Charming design, exquisite taste and classic detail inspire this European style collection. Stunning curved arms are hand finished with delicate features. India Scavo glass blooms at its opening to create a lovely glow. A stunning center piece ceiling light, with metalwork surround and large central glass dish. Suspended from ceiling rose and chain, with bold curvature to the scrolled metalwork creating interesting features without being overly fussy. Perfectly suited towards Edwardian and Art Deco influences. Supplied with 152cm of chain that can be shortened at the time of installation to suit your ceiling height; please see below for exact dimensions. This Deco style light is supplied by Elstead Lighting and designed in the USA by Feiss, founded in New York in 1955. They have become well known over the years for their contemporary yet classic styling, quality and great original designs such as the Kelham Hall British bronze finish 4 light pendant with Scavo glass up-lighter shade you see here.